There’s a lack of cheesecurds in the studio for this one as the hosts get ready to talk a little bit about painting depth and highlighting into models. Also, discussion about Cheddarbowl and the Battle for Big Bull Falls, 2 upcoming Warhammer Tournaments the hosts are planning on attending. Make sure your in Wisconsin that you get yourself registered for the Battle of Big Bull Falls, hosted by the Wausau Wierdboys and hosted at R.O.E. Games. The hosts get together and do their third battle report cast. In this one, Conesy is playing a potential Waaaghpaca list he has been fiddling with and Brian who stopped by in part a brings out his Tomb Kings. Can Conesy do something bone headed to give up the game or is this a full on whoopin’? Only one way to find out. Our hosts remiss about the first year in WiscoDice with a guest appearance from early in the show. The hosts loop back and talk about their first show main topic and things that they have seen done with the army, Vampire Counts as well. Conesy’s Rant turns into a challenge, and the fan has a love affair. Thanks for listening to our first year and here’s to the start of a new one! Episode 24 – Starring It Up!! The hosts talk about their experiences at The NorthStarGT and I think you all will be a little surprised with the success of the largest dollar/points concession at the event…Stompy! The hosts delve a bit into the decision making regarding purchasing a new army, largely from the new player perspective. There’s some really good stuff I think in their for new players and things for us to remember as we guide them into the game. We brought back the gaming spotlight in this episode and we talk about the Star Wars: X-Wing Miniatures game by Fantasy Flight. By now, pretty much everyone has heard about it and if you haven’t, go check it out! Great game and a lot of fun. 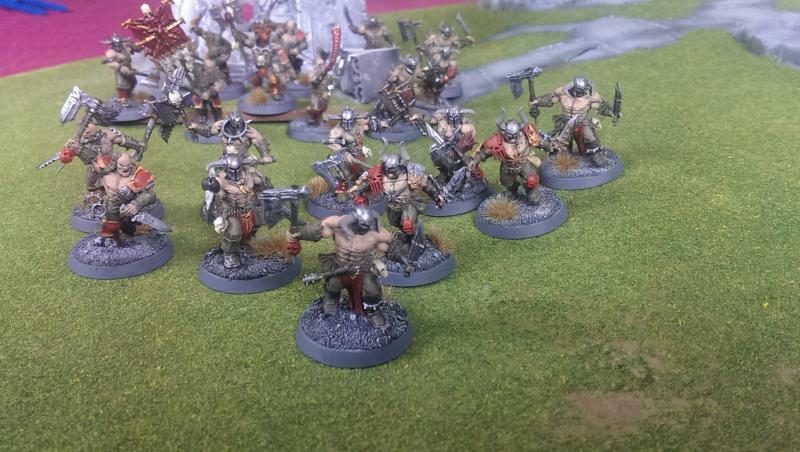 Honestly a miniatures game where the pre-painted miniatures are really well done which will mean you don’t lose time painting on your Warhammer army! Episode 23 – We’re K’Dai’N Here! Brought to you from the Last Square in Madison, the hosts talk about the all too vile Chaos Dwarfs. Joined by special guest Dustin, the hosts discuss the army options, how much differently it is to purchase this army vs. other Warhammer armies and what things you should really look out for. After the long night of Warhammer there is only the morning after. The hosts break down their experiences of doing the all day marathon of gaming and events in support of Extra-Life.org. Conesy’s Rant stirs up a little more grumpiness then usual and of course, somewhere in there the hosts talk some Warhammer. Thanks to all of you who donated to our Extra-Life campaign and helped us make our goals. Many children will benifit from your kindness. Be proud of it. As promised, we have released this episode, which matches up Daemons of Chaos vs Tomb Kings in what isn’t really a surprising outcome, but was a very surprising game. Catch all of the fun, exhaustion, and battle that was had in this battle.